About four months ago, I finally got around to launching an Instagram page for University of Portland. I’d been meaning to do it for a while, but time doesn’t grow on trees and I am terrible at taking pictures, so I always hesitated about diving in. But when I got a new iPhone in late November, I finally decided to take the plunge. Instagram: Making rainy days artistic since 2010! WOW am I glad I did. I just crossed the 1,000 follower mark (a really strong number for a school with just over 3,000 total students), and the momentum hasn’t stopped… growth has picked up steam rather than leveled off. Instagram’s engagement rates are super high – sometimes the same photo will get more likes on Instagram than Facebook, even though I have more than 12 times as many FB followers – and it provides so much more opportunity for interaction than Facebook does without the awkwardness of broadcasting “reply” messages to all of your followers like Twitter. Based on my experience these past few months, Instagram is where much of the action is for students of all stripes. I have seen so many photos of college mail and/or acceptance letters, campus tours, dorm life… students are posting a non-stop stream of pictures, and I have been blown away at how great Instagram has been for engaging them. That may change as advertising starts appearing and new social networks pop up, but right now it’s a place you absolutely need to be. Especially since prospective students are such a moving target. Like me, I’m sure many of you have noticed the trend that younger kids aren’t as active on Facebook these days. Once grandma joined, it was all downhill from there. As for Twitter… from my perspective, among the HS and college crowd there is a core group of “super users” that are very noisy, but not a large base of active users. For students, it seems like either you’re on it all the time, or you really don’t use it much. Twitter is very important, but when it comes to engaging prospective and current students I feel like I’m always seeing replies and RTs and mentions from the same people. Hopefully this list will be useful for higher ed social media managers thinking about launching an Instagram and for those that already have an active presence. Claim Your Username: Even if you’re not ready to launch yet, at the very least claim your username. This advice applies for every social network out there. Build a Photo Cache: Instagram allows you to upload existing photos, which can be really helpful when you want to launch a page or if you feel very uncomfortable taking your own photos. I wouldn’t rely on this too too much – capturing things in real-time is a powerful part of what Instagram is all about – but it’s a great idea to build up a collection of beautiful campus photos, great athletics shots, and fun historical photos to help you get started and to help bridge the gap when you don’t have time to get out of the office and take a pic. I always keep at least a few photos on my phone on the ready in case I ever need them. Search/Create Hashtags: You might think you already know what hashtags people use for your school, but you know what they say about people who assume… assumers never prosper. Or something like that. You can search for hashtags in Instagram, or you can use a website like WebStagram. Either way, be sure to take note of how many photos are tagged. Try every combination you can think of – abbreviations, nicknames, sports teams, etc. For UP, there are people who use #universityofportland #uportland #uofp #uofportland #up #thebluff #portlandpilots and #gopilots. 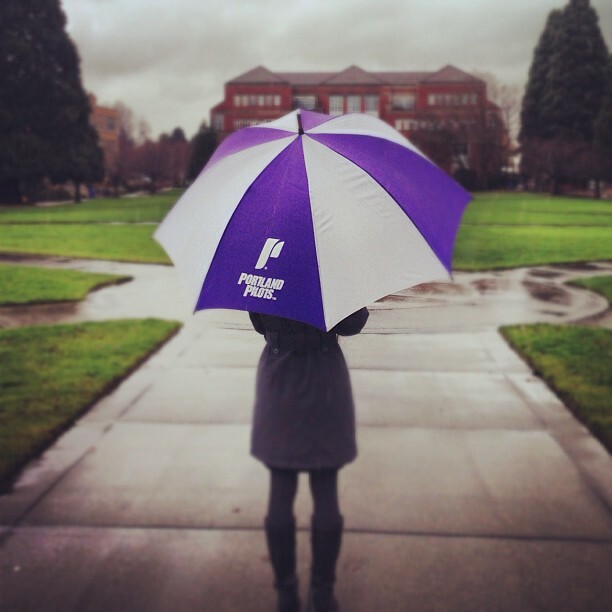 We try to push people toward #uportland and #gopilots, but don’t make the mistake of ignoring what people are actually using. Once you launch, use every hashtag that seems to be popular. (You can cut back on doing this once you are established a bit.) If there doesn’t seem to be a hashtag that people use for your school, create one. Here is a good guide to help you with that. Come On, Get Appy: Instagram users have pretty high expectations for the quality of photos. Its native effects and filters do a great job, but it’s helpful to have some extra apps that allow you to take Instagram to the next level. PicStitch and Squareready help with photo collages and vertical photos, respectively. Camera+ is awesome for improving the quality of your photos. PicFX is good for extra filters and effects. Such great engagement opportunities with prospective students. Link It Up: Link your new Instagram account to your school Twitter and Facebook accounts. A nice feature of Instagram is that it lets you choose when you want to cross-post, and you can even do it a la carte (i.e. just on Twitter, just on Facebook, etc. ), which is awesome. I tend to always cross-post onto Twitter, but only occasionally onto Facebook. Either way, take the time to set this up. Linking to a Facebook page is a bit tricky, so here is a how-to. Go Forth, and Promote: One big challenge with Instagram (though this is likely changing soon) is the inability to advertise within that platform that you have an active presence there. Which means you have to leverage all your other channels to let people know you are on there. Facebook, Twitter, internal communications, email newsletters… use every weapon in your arsenal, and do it often. Be very direct: “Follow us on Instagram at blah blah blah.” Cross-post a lot at the beginning. Keep reminding people every week or two for several months. Be Active: The most important point in this whole list. Like I said before, Instagram doesn’t allow you to advertise. But what you can do is like and comment your little heart out. Like every photo that uses one of your hashtags. Even better, comment. Photos on Instagram get lots and lots of likes, but not many comments at all. They really stand out. It’s OK to go back in time: like and comment on photos that are months old – it will help get you kick-started and let people know you're on Instagram now. Follow a handful of students, especially ones that have lots of followers themselves. Like and comment on their photos, even ones that aren’t specifically about your school. The more you do that, the more other people will see you have a page. Yes, this takes time. Yes, you have to do it. If you are a one-way street, your page will never take off the way you want it to. Don’t Spam: The second-most important point in this whole list. I follow a lot of colleges on Instagram, and the most common mistake I see is people using it the same way they would when live-Tweeting an event. One college, which will remain nameless, posted something like 30 photos from a campus snowstorm. Another posted dozens of photos from a major event. This is a huge turn-off for your followers, and a total misuse of the medium. Unless there’s a very good reason too, never post more than 2-3 photos a day. Even that is pushing it – I usually only post one. Instagram is NOT Twitter. Use Location Tagging: This is an absolute must. The location tagging tool on Instagram is a lot more important and powerful than people realize. You’ll find so many more photos (and potential new followers) this way than if you only search using hashtags. There’s a good chance every building on your campus will have its own location tag, and you will be able to engage with many more people and grow your follower count much more rapidly. There’s really no reason not to take advantage of this feature. Access = Success: When promoting/highlighting events, remember to take advantage one of your biggest assets: access. Instagram photos of crowds and stages tend to not work out very well, and anyone in the stands can take one exactly like that. But a photo from behind-the-scenes, maybe of a speaker chatting with the school president before taking the stage? Or in the locker room before tip-off of a big game? No one else but you can provide that. Bragging is so easy on Instagram! Steal - I Mean “Highlight” - User Photos: Chances are, you’re not a professional photographer. But you’ll find that some of your students are really, really good. So, why not showcase some of their best work? They’ll love the shout-outs, and you’ll increase engagement with high quality photos. You can’t download photos through Instagram and screenshots are awkward, so I recommend using a site like WebStagram to download photos from other users. You can post them on Instagram and on your other social media networks; just be sure to give proper credit. Alternatively, sometimes I will see great photos other people took and steal the idea by taking my own photo of the exact same thing. I have no shame. Be sure to follow all of your best student photographers, because it’s very likely they won’t tag all of their photos. Go Off Campus: Don’t be bashful about posting photos not taken on campus. If you’re out and about in the city, hiking in the forest, on a trip to the beach, whatever… people who follow your college will also be interested in seeing photos from the surrounding area. And keep in mind that lots of prospective students will be following you, and they may not be familiar with what exists outside the confines of your campus. Get Graphic: Instagram is meant for photos, but it can be a great place for simple graphics as well. Inspirational quotes, impressive statistics, event posters… all can be successfully used on Instagram. Just as an example, I created this very simple graphic (left) on the same day that Gonzaga University, a rival school in the West Coast Conference, was ranked #1 nationally in basketball. It was topical and very lightly adversarial, and my followers loved it. Don’t over-do it with graphics, but they can be a great tool when used judiciously. Bonus Step: Once you're successfully established, consider doing a monthly photo contest, like the one I highlighted from LSU on the blog. Monthly contests are common on Instagram, and this is an awesome way to really get people both excited about your Instagram page and using the hashtags you want them to.